As of the November 2018 general election, New Jersey had 5,877,680 registered voters, with 55% casting ballots in that election. There were about 2.4 million identifying themselves as unaffiliated with a political party; 2.2 million as Democratic; and 1.3 million as Republican. The largest registrations for third parties--all of which were below 10,000--were for the Libertarian Party; the Conservative Party; the US Constitution Party; and the Green Party. In the 2016 presidential election, according to the US Census Bureau, 60.1% of the state's voting age population were registered to vote, with only seven states having lower percentages. In 2019, Democrats hold majorities in both the 40-member state Senate (25-15) and the 80-seat General Assembly (54-26). In the 115th Congress which convened in January 2019, Democrats also hold both US Senate seats with Robert Menendez and Cory Booker; the state's 12-member delegation in the House of Representatives has 11 Democrats and only one Republican (Chris Smith) as a result of a sharp Democratic swing in the 2018 election, when five Republican seats were lost, shifting the previous balance of an evenly divided delegation with six Democrats and six Republicans. ​ Since the adoption of its current constitution in 1947, New Jersey has elected as governor five Republicans (Alfred Driscoll; William Cahill; Thomas Kean; Christine Todd Whitman; and Chris Christie) and seven Democrats (Robert Meyner; Richard Hughes; Brendan Byrne; James Florio; Jim McGreevey; Jon Corzine; and Phillip Murphy). In the 2016 presidential election, the Democratic ticket of Hillary Clinton and Tim Kaine received 55% of the votes to 41% for Donald Trump and Mike Pence. In 2012, President Barack Obama and Joseph Biden won New Jersey by a 17.7% margin over the Romney-Ryan ticket. Sussex County was the most Republican county in the state in the 2016 election, with the Trump-Pence slate winning 62.9% of the vote. Essex County, with 77.1% voting Democratic, and Hudson County, with 74.1%, had the highest Democratic shares in the 2016 election. In 2017, Democrat Philip Murphy was easily elected governor with 1,203,110 votes to the 899,583 cast for Republican Kim Guadagno, who had served as lieutenant governor under Governor Christie. New Jersey has voted Democratic in every presidential election since 1992, when Bill Clinton won a narrow victory over President George H.W. Bush. In the 1988 election, however, then Vice President Bush easily defeated Democrat Michael Dukakis by a 56% to 43% margin, and in nine of the 11 prior elections going back to 1948 the Republican presidential nominee carried New Jersey. The most recent victory by a Republican in a US Senate race was in 1972, when Senator Clifford P. Case was re-elected; only Hawaii has a longer period of continuous Democratic senatorial election victories. (In 1982, Nicholas Brady was appointed by Republican Governor Thomas Kean to fill the remaining nine months of the unexpired term of Senator Harrison Williams following Williams's resignation, but Brady did not seek election to a full term). In the 2016 presidential election, 68% of registered voters cast 3,957,303 ballots, the highest number in the state's history. The total ballots cast just exceed the 2008 number in which Barack Obama was elected to his first term, but the percentage turnout was below the 73% of 2008.. Most recent elections in non-presidential years, however, have seen historically low turnouts. In 2009, Republican Chris Christie defeated incumbent Governor Jon Corzine in an election that drew 47% of the state's registered voters and in 2013 Christie was re-elected with a turnout of only 40%; the percentage of registered voters casting ballots in both elections was the two lowest for gubernatorial elections in state history. In the 2014 election, when Senator Booker won his first full term and all 12 of the state's seats in the House of Representatives were on the ballot, only 36% of New Jersey's registered voters cast votes--the lowest turnout for a regularly scheduled federal election in state history. In contrast, prior to 1998 no federal or gubernatorial election in New Jersey had ever drawn less than 50% of registered voters, with the peak turnout of 91% in the 1960 presidential election in which John F. Kennedy defeated Richard M. Nixon. According to the Center for Responsive Politics, New Jersey ranked 13th highest of all states in campaign contributions over the 2015-16 national election, cycle with over $87.5 million contributed. Democrats received 54.2% and Republicans 42.2% of contributions. In the 2017 gubernatorial election, according to reports filed with the New Jersey Election Law Enforcement Commission, a total of $79.1 million was spent by all candidates, with Democrat Philip Murphy spending some $15 million in the general election, three times the amount of Republican nominee Kim Guadagno. The New Jersey Democratic State Committee and the New Jersey Republican State Committee are the dominant party organizations in the state. Other parties include the Libertarian and the Green Party of New Jersey. State committees are comprised of the chairs of each county committee, who elect a chair for the statewide organization. The state chair also serves as a member of the respective Democratic and Republican national committees based in Washington. Governors typically control the appointments to and operations of the state committees during their time in office. The opposing party frequently may use the state committee, and the post of its chairperson, as the platform to advance its positions. Various public opinion polls periodically survey opinions of New Jersey residents on elections and politics, as well as views on such topics as quality of life, the economy, health, the environment and leisure pursuits. The oldest continuing survey is that sponsored by the Eagleton Institute of Politics at Rutgers--which was the nation’s first university-based state survey when it was established in 1971--but other more recently established polls also receive extensive coverage. Polls conducted by he Monmouth University Polling Institute, for example, which was originally established with a focus on New Jersey surveys, became a widely-cited source on national politics in the 2015-2016 presidential campaign and have continued as a frequent source of sentiment on national and individual state politics beyond New Jersey. During election campaigns, candidates with sufficient funding also often retain private polling firms to conduct unpublished polls to help advise them on strategy, themes, issues and constituencies. Recent surveys have shown an increasing number of New Jerseyans expressing a lack of confidence in political institutions and leaders. A survey by the Fairleigh Dickinson University PublicMind Poll in November 2015 reported that a majority of New Jersey voters do not trust either political party to address the state's most pressing needs, including high taxes, a broken pension system and the nearly insolvent transportation fund. About 22% of poll respondents said they trust Republicans, and 27% said they trust Democrats, but some 47% said neither party was capable of providing the solutions to strengthen New Jersey's finances and fix its crumbling infrastructure. A prior survey taken by the PublicMind Poll in June 2015 also reported continuing declines in views of Governor Christie's performance, with 30% regarding him favorably and 55% unfavorably. The state legislature also received negative assessments: 24% of respondents approved of its performance in addressing the state’s problems while 44% disapproved. The same survey also found overall pessimism over the direction the state is headed, with 57% expressing concern over the state’s general direction and only 28% satisfied with the state’s overall well-being. In identifying primary blame for the state's problems, 50% of voters cited political leaders; 19% a divided public; and 23% a lack of sufficient funds. 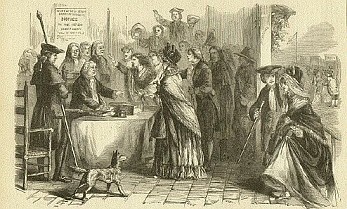 For most of its history, the dominant source of information and opinions on New Jersey government and politics was provided by print newspapers. In the nineteenth century, newspapers often were founded as openly partisan forums to advance their publisher's policy views and to aggressively support favored candidates. 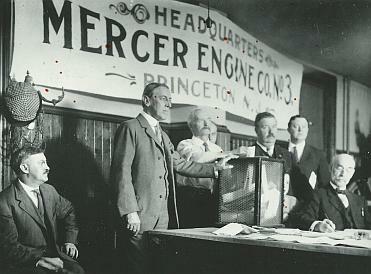 Through most of the twentieth century, newspapers continued to play a disproportionate role in New Jersey, particularly due to the state's lack of major television broadcast outlet when voters in other states increasingly shifted to broadcast media for information on state government and politics. Editorial positions in a state where surveys showed a general lack of public knowledge of statewide issues also could be influential in shaping public opinion. Until it ceased publication in 1972, the opposition of the Newark News to a state income tax was widely viewed as a major reason for the failure of tax proposals advanced by both Governor Hughes and Governor Cahill. The Newark Star-Ledger, the successor to the Newark News as the state's leading newspaper, also became highly influential in setting the state's policy agenda and determining its leadership, such as its advocacy of development of the Hackensack Meadowlands and the New Jersey Sports Complex and its support of the income tax and the re-election of Governor Byrne in the 1977 election. Over the last two decades, the growth of electronic media and the decline of print newspaper circulation and advertising--with resulting newspaper closings, consolidations and staff layoffs--have led to a fragmentation of the sources of state political information and opinion. All traditional print newspapers have launched sister electronic Web sites, with NJ.com, the digital outlet of the Newhouse publishing empire through its Advance Media unit, emerging as the state's most visited site providing content from the Star-Ledger, the Trenton Times, the Jersey Journal and its other newspapers. Web sites such as PolitickerNJ.com; PoliticoNew Jersey; and NJ Spotlight now regularly cover state and local political developments; and nonprofit sites including NJSpotlight, New Jersey Watchdog and New Jersey Policy Perspective cover news and also post studies and analysis of policy issues and options.